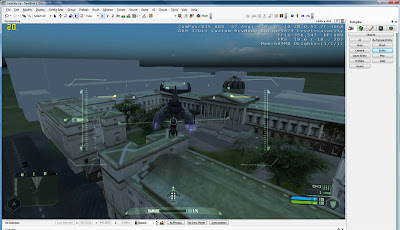 Crysis comes with its own Sandbox allowing 3d models to be quickly and easily imported into the game engine. Its early days but we have a quick and dirty model of the University College Quad, the London Eye and the Greater London Authority building running within the engine. At the moment we are working on importing a 2km square section of London into Crysis, we should have a movie online in the next couple of days. Thanks got to Joel at CASA for creating the work flow and import path – of note is the ability to import from SketchUp via 3D Max, allowing potentially any model from the Google 3D Warehouse to be imported, although we assume this would break license restrictions? this looks great – the only issue is modelling in sufficient detail to match the quality of the native crysis objects (trees, grass etc). At the moment there is a slight feeling that the buildings come off second best – though the trees do look a bit stuck on. What software did you use to create the model you imported? Does the Crysis engine support most formats? It was modelled in SketchUp and then imported to 3D Max – in a similar way to our Oblivion tutorial. Max exports to Crysis – so as long as you can read it into Max you can view it in game. Now all you need to add are some turrets, some tornadoes and some aliens. BTW what format did u impor the geometry in? I’ve been following this use of the game tech for a while now. Ever since I saw the first examples of Crysis used for Viz purposes I’ve been hooked on the idea. But I didn’t get around to trying it out myself. This could be a really useful tool for those of us who work in the visualization business. This is fantastic! Do you know if there is a way to get rendered frames out of the crysis engine? Can you use this as a real-time renderer? Yes. You can get rendered frames out of Crysis. At almost any res. Real-time. Its quite fantastic. You can output a sequence of files as well. As to make animations. You can output them to several different formats. JPG or TIFF for eksample. Its very very nice! DrAndrew, thanks for the crysis tutorials and the blog in general. Ive got a project illustrated using cryengine2, im an inhouse visualiser for a small architecture practice. Real-time, user controlled or pre-defined shadow studies at any scale or any speed. All kinds of aquatic effects including fountains, pools, rivers and of course the ocean itself. We’ve got years of game-modeling experience, so it’s no problem for us to create highly detailed models that look as real as the CryEngine can produce. We also understand the inbuilt shader engine quite well, so all our textures look as real as Crysis can do. Presentation tours- these are pre-programed tour points that allow a presenter to push a single key and show the audience any pre-arrange point of interest. From there the presenter can then fly or walk the camera where ever they like. Our scenes to date include Urban, Rural, Tropical, Temperate, City and Marine environments. We can include pedestrians to fill the scene out. These “people” can walk, drive or move in most other ways around the scene, even stopping to admire pre-selected points of interest. Vehicles of almost any description. Cars, boats, motorcycles, planes, trains and bicycles. All being driven or ridden by AI driven pedestrians. We can do real- time Depth of Field, colour correction, full sound-scapes in 5.1 surround and output these (except the sound) in real time. There’s also a few other presentaion oriented features we’re working on that I’m not able to discuss here. Once Crytek sorts out their licencing issues we’re planning to roll this out to our clients. No offence, but could you stop posting the same video over and over and over? How about actually posting a tutorial for once?